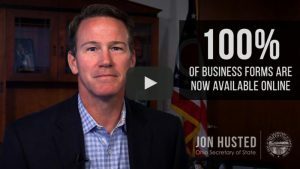 Earlier this week Secretary Husted announced that 100 percent of all filings needed to start or maintain a business in Ohio may now be submitted online and business owners may now submit all Uniform Commercial Code (UCC) statements and certified search requests online. This completes an effort that began in 2013, when Secretary Husted launched Ohio Business Central to modernize operations and better serve business owners. The online filings effort is among a series of initiatives, led by Secretary Husted, that aim to alleviate the bureaucratic constraints and costs on Ohio’s job creators. Two years ago, Secretary Husted reduced the cost of starting and maintaining a business in the Buckeye State by 21 percent. This change has saved Ohio businesses over $4.5 million to date. In 2016, Secretary Husted contracted with the Cleveland Sight Center to manage the Business Services Call Center, which assists entrepreneurs with starting and maintaining a business in Ohio. The collaboration with the Cleveland Sight Center has paid off significantly as average call wait time has dropped from more than five minutes to just 14 seconds – a reduction of 96 percent. Secretary Husted’s work to build a more business-friendly economy has been complemented by efforts to make his own office more efficient. As part of the recent state budget process, Secretary Husted requested a 100 percent cut in the amount of tax dollars needed to run his office. Husted’s request will save taxpayers nearly $5 million over state fiscal years 2018 and 2019. Additionally, during his first term, Secretary Husted reduced spending by $14.5 million, a 16 percent reduction when compared to the previous administration. He is also operating his office with nearly 40 percent fewer staff and payroll costs are at the lowest level in 10 years. Learn about the resources and programs available in the Secretary of State’s office. Get information on how to start your own business and elections.